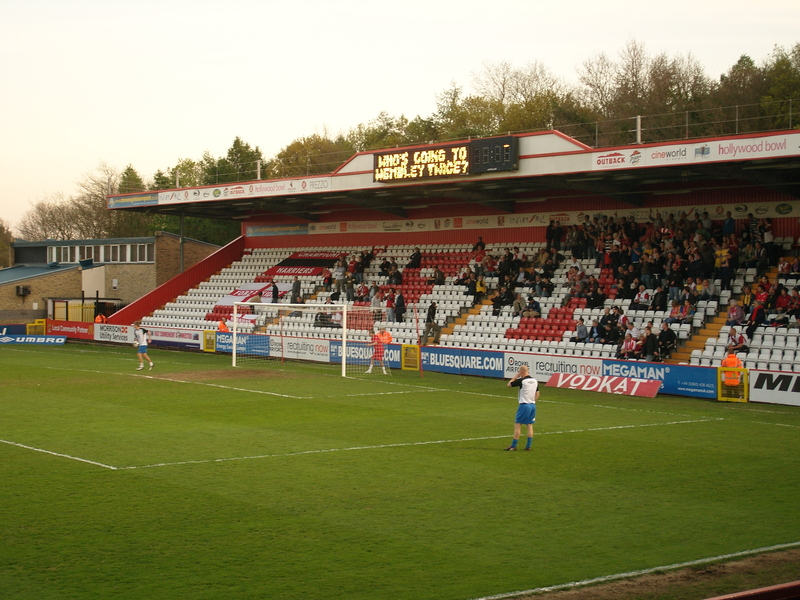 Ground Name: The Lamex Stadium (But still known to many fans as Broadhall Way)Capacity: 7,100 (Seating 3,412)Address: Broadhall Way, Stevenage, Herts, SG2 8RHMain Telephone No: 01438 223 223Fax No: 01438 743 666Team Nickname: BoroHome Kit Colours: Red & WhitePitch Size: 110 x 70 yardsOfficial Web Site: www.stevenageborofc.comAbout the Broadhall WayCertainly one of the better grounds in the Blue Square Premier and one which would not look out of place in the Football League. On one side is the all seated covered, Main Stand, that looks quite impressive. It is unusual in so much that at the back of the stand on either side of it, there are large gaps between the back of the roof and the stand below. Whilst in the middle of the stand at the back, there are a number of glass fronted areas to various Club offices. Opposite is the fair sized East Terrace, that is covered and is quite steep. Eventhough like the rest ground, the stand is relatively new, it does have a gable with a clock sitting on its roof above the half way line, which gives it a touch of character. At one end is the South Stand, which is another single tiered all seated covered stand. This stand given to away supporters. There is an electric scoreboard on the roof of this stand. 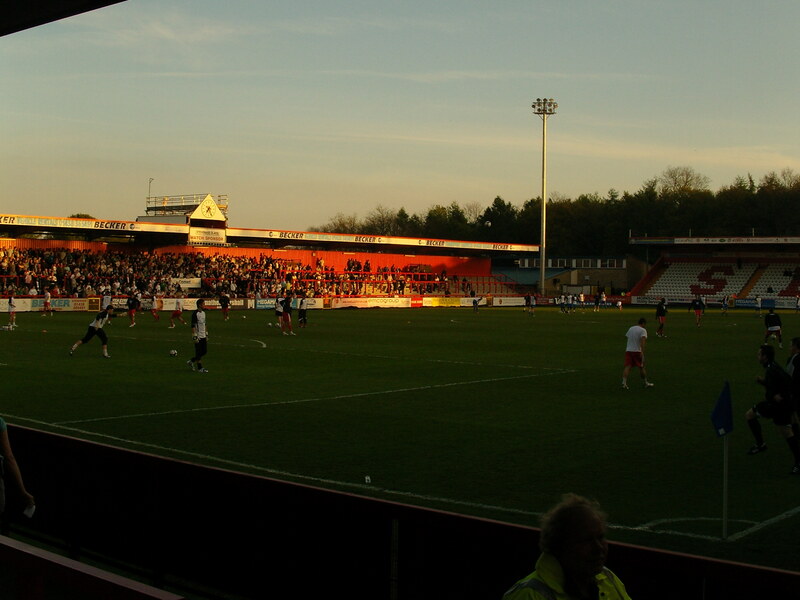 Opposite at the North End of the ground, is a small covered terrace. A set of four new floodlights (one pylon in each corner) were installed for the start of the 2007/08 season.Thanks to Duncan Adam for the above informationGetting to Broadhall WayIf you are driving you will undoubtably come via the A1. In which case exit at Junction 7 and take the A602 towards Stevenage. Go straight across the first roundabout and as you approach the next roundabout you can see the floodlights of the ground over on the right. However, if you go straight across the roundabout then you will see the entrance on the left to the large official car park which is free. You can also take the 1st left at the roundabout and park in Old Meg – not the local witch but an retail park.The nearest station is Stevenage which is about a mile away from the ground. Leave the station booking hall and turn left towards the town. Take the stairs on the right before the bridge over the dual carriage way and head along the A602, Lytton Way. At the roundabout which has the police station on the right, take the second exit into Six Hills Way. At the next roundabout take the third exit (south) continuing along the A602, Monkswood Way, passing a large Asda store on your right. After about 3/4 mile (McDonalds/Burger King etc will be on your right) you will arrive at a roundabout and the ground will be opposite you on the other side of the A602. How to get a ticket for Broadhall WayIt’s pay on the door for all games (bar any big FA Cup matches) at Stevenage. Even the FA Trophy Semi-Final this season only attracted just over 3,000. Pricing is relatively simple – £15 for a seat in the main stand or away end behind the goal and £12 for a place on the covered terrace. Our Last Visit – Stevenage Borough 3 Kidderminster Harriers 1 – 21st April 2009As a new twist to the family of football offerings from Fuller Inc you can now add Scouting. Not the Baden Powell type but the “seeing what talented footballers are out there” type. I had been asked by a certain football league club to have a look at Kidderminster Harrier’s Player of the Season in 2007 and 2008 Mark Creichton in their game at Stevenage Borough. This suited me perfectly for three reasons:- 1. I hadn’t been to Stevenage for over 12 years; 2. I have always said I knew more about football than most of the people I have ever met in football. 3. I managed to persuade Football Jo to come, and to get her to drive me to and from the station Let’s look at point one. In November 1996 on a “country drive”, CMF and I stumbled upon a small farm called Tewin Bury. At the time we were shacked up with Marc Oedipus in our love nest in Notting Hill (above Mike Atherton, opposite Lawrence Dallaglio and two doors down from Norman Lamont if you wanted to know) and in a rash moment of impulse we decided to get married there. We were not engaged, nor had we ever really planned to get married but we (well she) was seduced by the beauty of the venue, and they had a space for our (her) preferred date in August 1998. So we booked it and I paid a £2,000 deposit. I thought it was a tad unfair that we had spent so much money on something I would get little enjoyment out of (don’t say I just said that!) so I suggested we go into Stevenage so that I could look in PC World. Thirty minutes later I had spend £1,000 (Remember this was pre-little Fuller’s and life was good) on a new PC and £400 on a new DVD player (at the time when they were like suitcases). I noticed that a few people were parking on the retail park with football shirts on and threw in a request to go to the game, whoever the locals were playing. The response I got chilled me to the bone:- “Now that we are engaged that is fine” Er when had I proposed. Sure, I had just paid £2,000 as a non-returnable deposit on a wedding but that wasn’t the same as actually proposing. Still I bit my tongue and we went off to find out it was an FA Cup 1st round game between Stevenage Borough and Hayes in the FA Cup. Anyway, back to the present. Yes I went through with the wedding and yes I did the proper proposal (Amsterdam 9th February 2007 if you want to know) and yes I had never been back since. Football Jo was at a loose end as her latest chap had decided to go to work so she wanted to come along and “advise” me on the best players to scout. It was going to be an interesting evening. So 20 minutes after being picked up in Harpenden we had parked across the road from the ground. Inside the stadium hadn’t changed much – a new roof at one end but it still looked one of the better stadiums in the Conference. Stevenage had been there or there abouts on a number of occasions at this level, coming mightily close in 1994/95 when they actually won the Conference but the stadium was not deemed fit to allow league football. It took then nearly a decade, a few financial close escapes and an FA Trophy victory to get back into the play offs but they lost to Carlisle United in 2005. This season their form had taken them from the bottom three (after a disastrous start which saw them lose 5-1, 3-1 and 4-0 in their first four games) to the situation in early 2009 when they won ten consecutive games. In fact since the turn of the year the team had only lost once in their last thirty games and that was to tonight’s opposition just two weeks previous. Kidderminster had also been in a similar position to Stevenage in that they had finished top of the conference in 1994 but were refused entry into the league due to the ground not being up to standard. This was rich at the time considering the state of a number of grounds in the Football League. Who can ever forget visiting grounds like Barnet, Blackpool or Cambridge United in that season and seeing the poor facilities on offer. Ironically that season they hosted West Ham United in the FA Cup in front of 8,000 at the so-called unprepared stadium without any issues. They eventually made it into the league in 2000 when they won the league at a canter. If ever there was a title not to make the step up to league football it was 2000. First went the revenues from ITV Digital, then the revenues from the deal to supply websites through Premium TV and finally the strength of the local Premier League teams meant that money was hard to come by. They returned to the non-leagues in 2005/06 and have since failed to threaten the top of the league until this season when Manager Mark Yates has created an impressive attacking team. Their home form for most of the season has been the impressive element so this game was to be a real challenge for them. There was a fair size crowd in the stadium for his one. Obviously the Stevenage public had been wowed by the style of football they had seen and the astounding results of the team. Quite rightly the club can be proud of their performance in the second half of the season, but with up to six big games left it could all end in tears. Step one was to beat Kidderminster Harriers, one place above Stevenage in the league in what would be a huge motivational boost for the team. I was very keen to see how the Stevenage front two played. I had heard good things about Morison up front, and being one of the leading scorers in the league where goals are often hard to come by was going to be interesting. Lee Boylan on the other hand was a name from the past. I first saw him in West Ham United’s youth set up in the late 1990’s, and was at the Youth Cup Final at Anfield when West Ham lost to Liverpool 2-1 in the second leg in a team alongside Rio Ferdinand and Frank Lampard (The Liverpool team on that day included Gerard and Michael Owen). What did surprise me was that he had appeared to have scored many goals so far this season. Kidderminster had an impressive front two themselves, with Barnes-Homer and Richards having scored 35 goals between them, making them the most prolific duo in the Blue Square Conference this season. So the game started on a lovely Bedfordshire (or is it Herftordshire?) evening and it was obvious that the man we had come to watch Creighton looked tired and unfit. He seemed to make his way forward for early set pieces but left his team mates exposed as he was not able to get back in time to assist the defence on the break. Stevenage attacked from the word go and right midfielder Drury impressed with his speed down the flank. From his cross on four minutes top scorer Morison slammed the ball home after his initial shot was blocked. Kidderminster were reeling and within minutes it was nearly two as Morison took a ball on his chest on the right hand side of the penalty area and hit a magnificent volley that dipped, curled and swerved over the keepers head before it smashed into the bar. Stevenage were certainly playing impressively and it took a good half an hour before Kidderminster found their rhythm. Their front two were certainly fast and the midfield engine Penn (who was rumoured to have been the subject of a £100,000 transfer approach recently) was instrumental in pulling them back into the game. His pass found Richards 20 yards out and his quick feet found a space and a shot which ended up in the back of the net to make it one all. The second half was a completely different story. To tell the truth we had given up watching our friend from Kidderminster as he was simply being run ragged by Boylan and Morison although he was certainly “no nonsense” in his approach to defending, a characteristic that is essential at this level. Just two minutes into the second half Boylan turned him around 30 yards out, took two steps and then rifled a low shot into the corner. Fifteen minutes later he made it three one when he beat Creighton at the near post to turn in a smart cross from Mitchell Cole. After this the game was never in doubt. Stevenage have hit form just at the right moment and this win lifted them into the playoff places for the first time in a few weeks. With just one game to go they now hold the upper hand over Oxford United, Torquay United and Kidderminster in the race for the final slot. 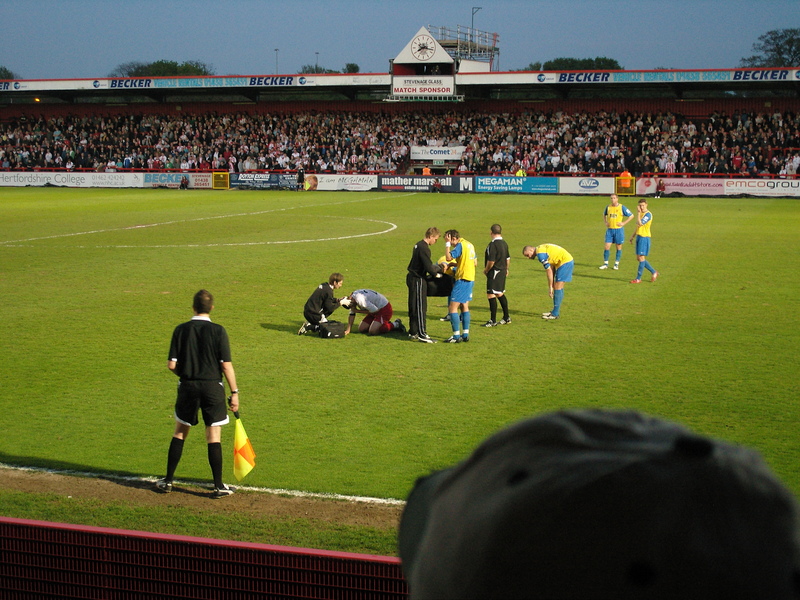 Kidderminster seem to have done enough to earn a spot, and with Torquay United hosting Burton who have to win they could still yet make it into the end of season shake down, and who knows a repeat of the 2007 FA Trophy final against Stevenage. We exited stage left, winding our way through the non-league WAG’s (have to be seen to be believed), past the signs around the pitch for “missile defence systems” (I didn’t know it was so rough in the town) and crossed the main road. Outside the car park was a Robin Reliant with the sign Boys2Men on the side – nothing like drawing attention to yourself…As I say – strange place Stevenage. Sanchez: The final chapter of Arsenal's loopy story?